Caliph Washington's life was never supposed to matter. As a black teenager from the vice-ridden city of Bessemer, Alabama, Washington was wrongfully convicted of killing an Alabama policeman in 1957. Sentenced to death, he came within minutes of the electric chair-nearly a dozen times. A Kafka-esque legal odyssey in which Washington's original conviction was overturned three times before he was finally released in 1972, his story is the kind that pervades the history of American justice. Here, in the hands of historian S. Jonathan Bass, Washington's ordeal and life are rescued from anonymity and become a moving parable of one man's survival and perseverance in a hellish system. 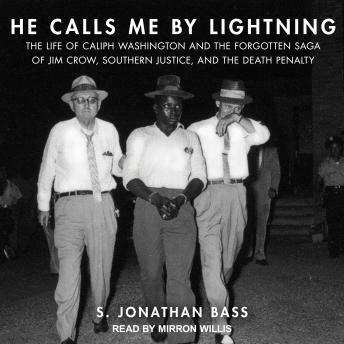 He Calls Me by Lightning is both a compelling legal drama and a fierce depiction of the Jim Crow South that forces us to take account of the lives cast away by systemic racism.